The F050G1L PC pump for heavy-waste soilds-laden sewage waste by up to 50% by volume allows even the toughest mediums to be pumped in lift stations. 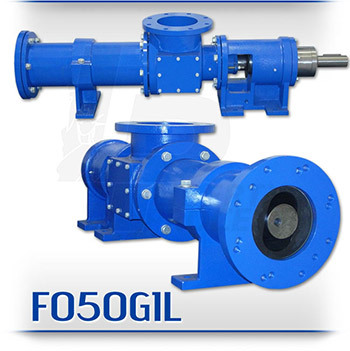 The F050G1L’s low shear and gentle pumping action enables it to not emulsify the pumped liquid medium(s) making it an ideal pump for the sewage and liquified sewage transfer. All parts for the F050G1L series such as rotors, stators and internal wetted parts such as seals and connecting rods are aftermarket replacements that dimensionally interchange with other popular manufacturers pump models like the *Moyno® 2000 Series, the *Tarby® Century V Series, and the *Continental® CG Series of Progressive Cavity Pumps. The F050G1L is a standard ANSI flanged sewage pump design manufactured with high strength cast Iron or 316 Stainless Steel pump casings and designed in 1, 2 and up to 4 stages for 85, 170, and 350 psi discharge pressures making it an ideal low-cost, maintenance free drop-in replacement pump. Standard suction and discharge flange size for the F050G1L is 6″. All other wetted parts are either carbon steel or 316 stainless steel. You can count on Liberty Process for your pump parts being shipped to your location quickly from our available stock. The standard seal design is a set of packing with a Lantern Ring and flush connections. Mechanical seal options are readily available.